Garden plot clean up inspections are Monday, November 6th. Please clean up all garden plots are walkways surrounding your garden plots before Monday, November 6th. Inspections will be Monday, November 6th. September 16th: Stan Hywet Hall and Gardens. Meet at OVCG at 9am. Other upcoming outings: to consider Holden Arboretum, Case Western Reserve – Fairmount, etc. Please pull weeds in your garden beds and around your garden area on the paths. Otherwise, the weeds will be sprayed. Pulling weeds will reduce the likelihood of having herbicides sprayed in the garden. If hoses are hooked up to the common spigots, please share. Anything hooked up to a spigot is considered community use. If you plan to allow your plants to go to seed, please use a cloth or nylon bag to collect seeds and prevent them from spreading throughout the garden. Please consider volunteering to help promote the garden to community members. We may need people to shuttle people over to the garden (maybe in a golf cart if we have permission) and also to be at the garden to give tours and show off the garden. UPDATE: We still need volunteers but we will not be doing tours of the garden. Volunteers are needed to help out with the Salute to Orange at the Village Hall/Fire station. Gardeners who have extra produce to spare are asked to donate produce for a display at the Salute to Orange. Baskets will be donated afterwards. If you know of anyone who would like a tour of the OVC garden, please contact a member of the garden club. We also welcome schools and girls and boys organizations to visit our garden. Please let us know what your group would like for us to do to help. Cucumber beetles: some people use seven dust (not organic), others use diamataceous earth (organic, does not harm animals or humans). Please join us for the garden meeting on Saturday, July 8th at 10am in the Orange Village Community Garden (in case of rain we meet in the Village Hall). Come join the discussion ; we welcome your ideas and input. Please join us for a tour of Benjamin Franklin Community Garden on Saturday, June 24th. We meet at the Orange Village Community Garden at 9:15am and carpool to the Benjamin Franklin Community Garden at 1805 Tampa Ave, Cleveland, Oh 44109. The tour is scheduled to last approximately 1 ½ hours, starting at 10am. This is the first community garden in the USA, founded in 1929. 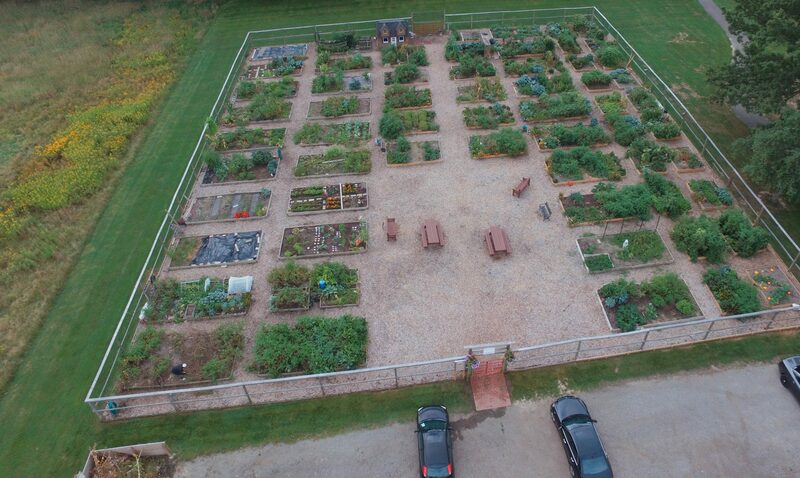 It is also the largest community garden in the state, covering 5 acres and 180 plots. We had a good Orange Village Community Garden Meeting in the garden at 10am this morning. Most gardens are looking great! Cucumber Beetles have been seen in the garden so it may be a good idea to spray for them early. Some gardeners use Garlic oil or neem oil. Eddie, our local Master Gardener, suggests using a solution of neem oil in water. He uses 1 ounce of neem oil per 1 gallon of water. Some recipes online also suggest adding a small amount of castile soap as well. Another gardener uses homemade garlic oil to deter pests. Gardeners took a tour of the garden and enjoyed all the beautiful plants gardeners are growing. A few gardens had tall weeds growing and need to be removed. If you have not visited your garden in a while, please stop by to make sure that there are not weeds growing. Warning letters will be sent soon. Field Trip: June 17th: we are planning to take a tour of a local garden. More information to come..
Garden Meeting Saturday, June 3, 10am. Join us for the next OVCG garden meeting on Saturday, June 3rd at 10am. If the weather is nice, we will meet in the garden. Otherwise, we will meet in the Orange Village City Hall. Garden Clean up day was a success! Please take a look at what volunteers accomplished to improve organization and functionality of the shed and surrounding area! The shed was cleaned out, repaired and reorganized. The bulletin and dry erase boards were moved to create space for a tool organizer for shovels, rakes, broom, etc.. If you would like to, please add your name to the list of names and plot numbers on the dry erase board so that fellow gardeners can learn your name. The area surrounding the shed was cleaned up as well. The muddy space behind the shed that had filled up with broken wire cages and muddy tarpes was cleaned. Tarpes were refolded and stacked outside of the shed under a wood base topped with a planter of nasturtiums and lunaria. Wire cages were reshaped and some reused by gardeners and others are stacked inside the front of the garden by the gate. The area behind the shed was planted with raspberry plants donated by Fred. The berries will be for community use. So if you see berries ready to pick in coming weeks, please take some. Thank you Fred! Please take any items that are stacked inside the front gate of the garden. Items by the trash are more broken and those on the other side of the gate are in better condition. Please take what you would like by the end of Memorial day. After Memorial Day, the items will be thrown away. THANK YOU! Thank you to everyone who participated in OVCG clean up day! Friendly reminder that gardeners are gathering this morning to clean up the garden shed and surrounding areas. Please join us when you can between 9am and noon. If you cannot come for the entire time, please just join us when you can! Please join your fellow gardeners on Saturday, May 20th from 9am to noon or so to clean up the shed and surrounding area. Let’s start off the 2017 season by getting together to improve our garden for everyone! It is a great chance to get to know your garden neighbors too.